Important changes are coming to MoPac. But they won’t help you safely get places faster. For real improvement, we need a shift away from car-centric, low-density policies. Metro Austin’s regional transportation planning agency wants more highway lanes. 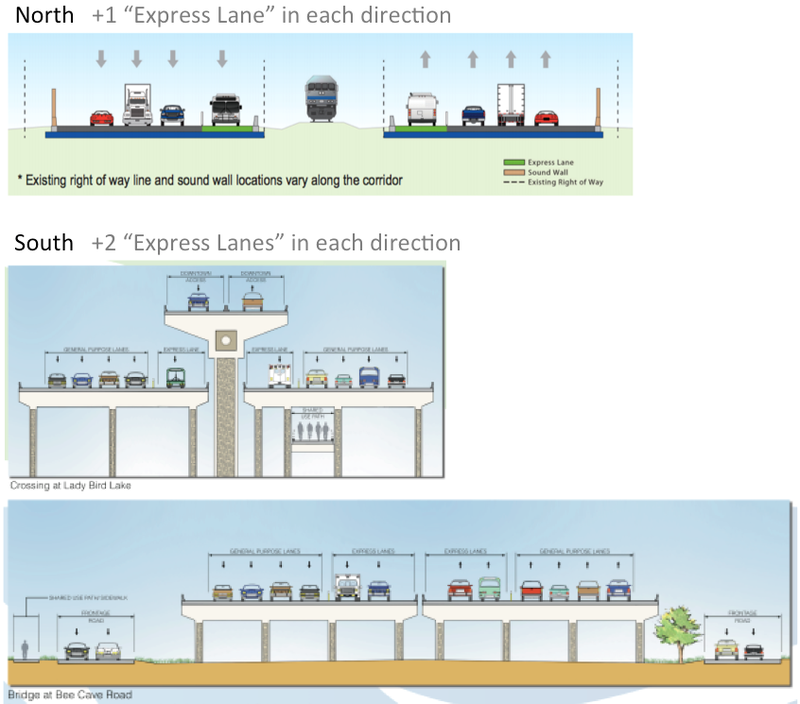 On MoPac, new “Express Lanes” will feature “congestion pricing”, which is a dynamically-priced toll. A northern segment of MoPac from Chavez to Parmer is adding one “Express Lane” in each direction. This is referred to as the “MoPac Improvement Project” and construction is already underway. As for the changes to southern MoPac, there’s opposition to a potential expansion that includes two new Express Lanes in each direction. MoPac’s changes are in tune with a new plan (“CAMPO 2040”) from the regional transportation planning body. The new plan prioritizes significant road expansion throughout metro Austin and is supportive of the use of congestion pricing as a key revenue mechanism. This plan doesn’t reduce demand for housing in our region. Since there are no regional leaders explicitly championing higher unemployment (and they shouldn’t), the region will continue to grow. No one wants to actually pay for roads. Texans (including Central Texans) are not willing to tax themselves at a rate that would allow the truly massive road construction and maintenance needed to ensure speedy car commutes for our population. The MoPac project and the CAMPO 2040 plan’s documents admit that sprawl & “induced demand” make it near certain that travel speeds will continue to decrease. And new, bigger, more complex highway designs undermine the feeling of safety for travelers. Finally, Austinites reject candidates that support the dense residential development needed for a broad shift to transit commutes. Ultimately, the changes at MoPac are a financing strategy to build additional road capacity that supports our existing sprawl approach. The two major policy paradigms in Austin politics – the growth-skeptical environmental approach descended from late 1980’s aquifer fights and the present-day business associations – have accumulated policy contradictions that make success impossible given current growth realities. For example, in this south MoPac debate, “Keep MoPac Local” – the umbrella coalition of Austin environmental groups – argues against new capacity and tolls; many of its member organizations and leaders support low residential density policies and candidates. On the opposite side of the MoPac debate, leading business organizations support the dense land use that could support a shift to transit, (as well as the revenue from congestion pricing that could help transit), but then undermine those goals by backing substantial increases in road capacity. A new approach is needed. A “progressive urbanist” approach remixes the anti-growth environmental and business preferences into a coherent package that is fiscally sound and optimal for the environment . The new approach agrees with the growth skeptics that additional capacity will result in sprawl and creates a fiscally burdensome road maintenance obligation; but to accommodate the region’s growth, it supports land use liberalization that entitles greater residential density. Like the growth skeptics, the proposed new approach believes in the need for a shift to transit and sees the redistribution of congestion pricing revenues into transit service as essential given the paucity of operating resources for public transportation. The new approach agrees with the business organizations that congestion pricing is a useful tool; however, the goal of revenues from pricing road capacity should be to support a shift away from car use through transit, bike, and pedestrian modes. It should not be exclusively utilized to support building even more road capacity.